The European Union has flourished and expanded over the last fifty years as a unique system that lies midway between a federal state and an anarchical international system. Different actors coexist within a cooperative hegemony of Member States, and the allocation of competences and decision-making among them has always been at the centre of the integration process. In fact, demands for clearer limits to the Union’s decision-making power and enduring tension over the nature and purpose of European integration have been the key drivers of integration and change. the spectre of a powerful ‘core’ Europe and a ‘multi-speed’ Europe of pacesetters and laggards. Addressing numerous crucial issues – among them the degree of permanence of the nation-state in a context of ambiguous constitutional authority, and the width of the democratic base of the Union’s ‘institutional dynamic’ of cooperation and consensus – the author lucidly describes a seeming paradox: an ‘ever-closer union’, with a growing democratic legitimacy, congruent with a supranational community that falls short of a fully-fledged democratic political entity. The countless perspectives and clarifications discovered along the way are sure to engage academics and policymakers working in the fields of the European integration project, and will provide ample insights and food for thought. Preface and Acknowledgements. Table of Abbreviations. Table of Cases. Table of Treaties. Introduction. 1. The Evolution of Internal Community Competences. 2. The Institutional Actors and the Horizontal Division of Competences in the Community. 3. Cooperative Federalism, Primacy and European Constitutionalism. 4. Subsidiarity and the Monitoring of the Jurisdictional Limits of the Community Legislative Process. 5. Subject Related EU Internal Competences. 6. The Main Categories of Objective Related EC/EU Internal Competences. 7. 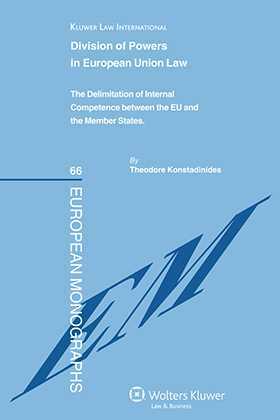 Competence Delimitation From Laeken to The Treaty of Lisbon. 8. A Variable Geometry of European Integration: Enhanced Cooperation and a Core Europe. Conclusion. Selected Bibliography. Index.